CAUGHT ON CAM: Baron Geisler on Beast Mode and Strangling a School Boy? Baron Geisler is now on the hot seat again because of a video posted by a Facebook user. 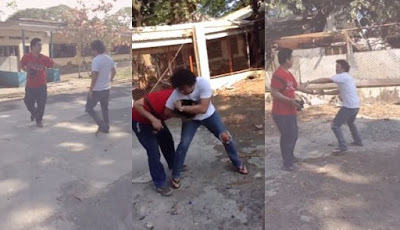 Khalil Verzosa introduced himself as a student and bluntly stated the reason behind Baron allegedly reached his boiling point and wrapped his arm around a man's neck. Verzosa said in his video caption that Geisler agreed to act for their editorial design campaign in a school production. He also admitted that it was their fault to provide Baron the script later that the schedule. This is allegedly the reason for Baron's rude behavior. However, the student firmly stated that in spite of their drawback, the famous actor doesn't have a right to go on "beast mode." According to the caption, Verzosa posted this video to teach Baron a lesson.